Tuesday, April 26, 2011: Up early and broke camp in order to continue our trek. Larry invited us to join him at an in-town hangout for an excellent country breakfast. Our bellies full, we got on the road at 1015 under clear skies and cool temperatures. 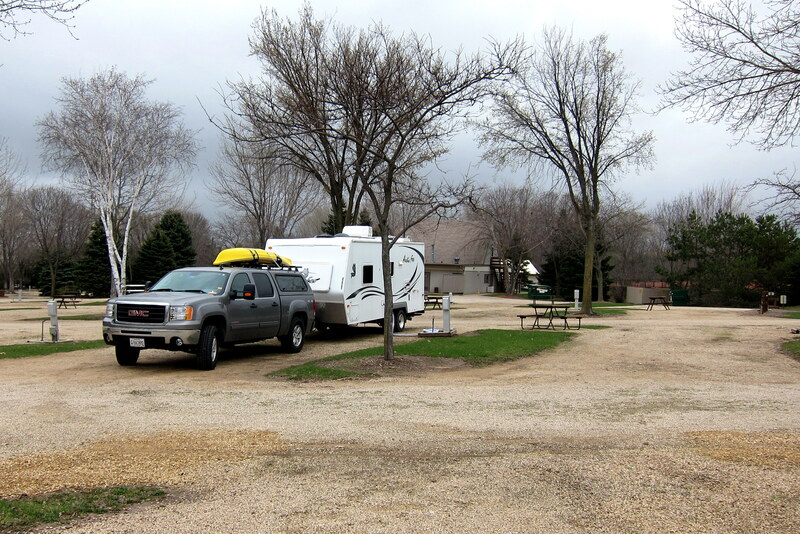 Before leaving town of Cherokee, we did a drive by of the municipal park that features a pond and RV campground. It would be a nice camping opportunity, but not as nice as Larry’s farm. On highway IA-3 heading east we drove through the pleasant little town of Storm Lake which is the home of Buena Vista College. Touring the lakeside we enjoyed viewing some very nice waterfront homes and cabins. Needing fuel we stopped at a local gas station. Now, as you know, the cost of gas has gone up over the past few months. Apparently the economic law of supply and demand has been replaced by the political law of fear monger and gouge. At this particular station 87 octane regular was $3.85 per gallon. However there was also 89 octane “super regular” for only $3.05…..however it was E85, or 85% Ethanol, which is heavily subsidized here in corn country. Unfortunately our truck can’t burn E85, so the subsidy does us no good. Oh, In case you’re curious, there are “pointy roads” in Iowa as well. Nearing Milford, Iowa we came across Gull Point State Park and noticed that it featured many recreational opportunities including a campground. Actually the anchor on the lawn caught my eye so we pulled in, self-registered and chose a nice sit in the sparsely populated campground. 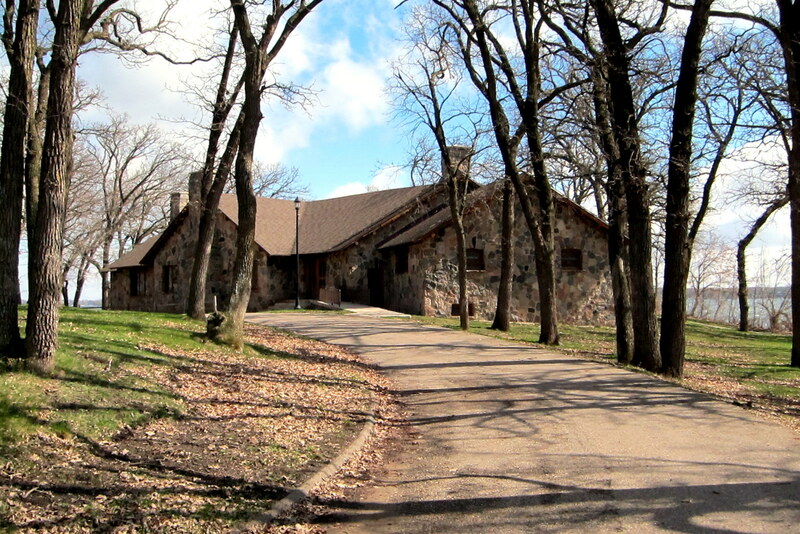 A short walk down the campground access road we came to a CCC built lodge on Lake Okoboji. It was closed until summer but peering through the windows it looked like a great place for a large gathering. 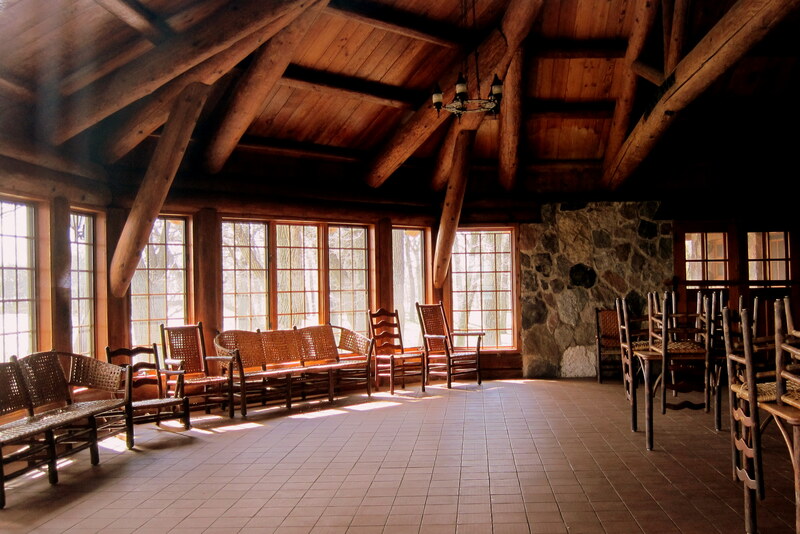 Next to the lodge was a smaller CCC built building used by the State Park and Lake Patrol staff. Returning to the campsite we enjoyed a nice meal and settled in for the evening. Wednesday, April 27, 2011: Well…..apparently we outran spring. This morning it was 35 degrees and overcast so we took our time to get underway. After a brisk walk around the facility, we pulled out of the campground at noon. 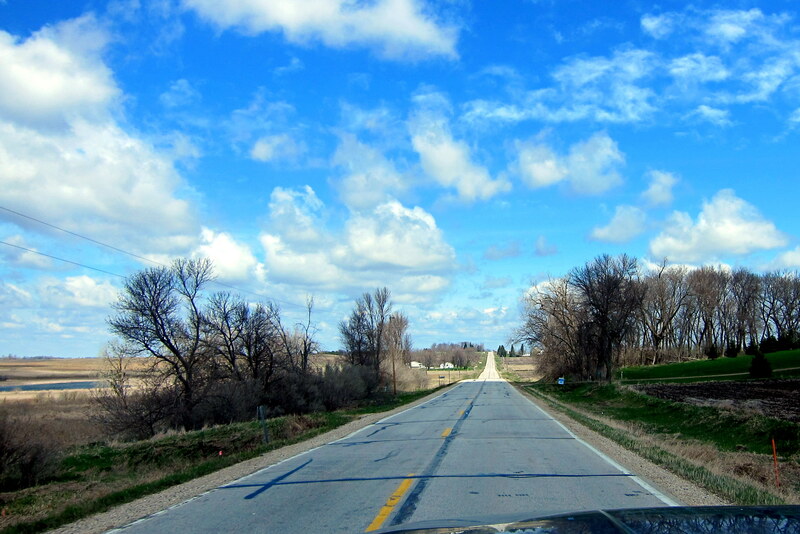 We drove highway IA-86 heading north crossing into Minnesota at 1215. Arriving in the town of Lakefield, MN we moved over to MN-60 and once again proceeded easterly. 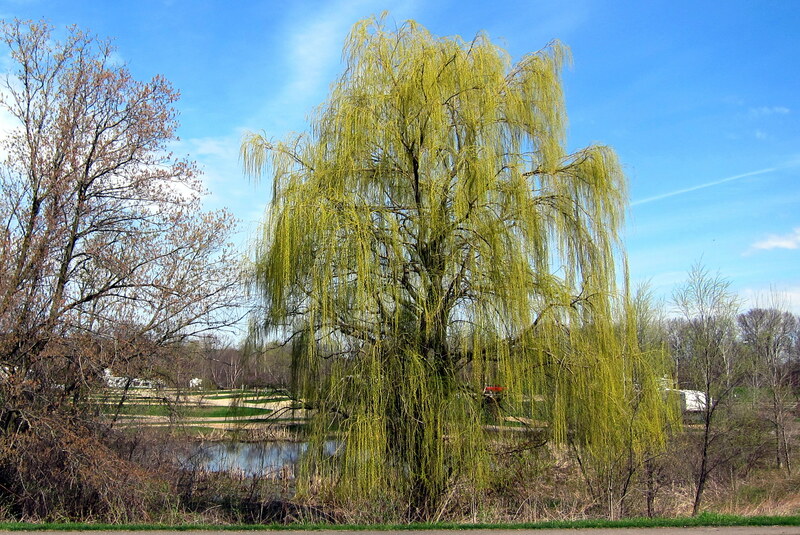 At midafternoon we pulled into Saint James, MN and stopped at their lakeside municipal park for lunch. 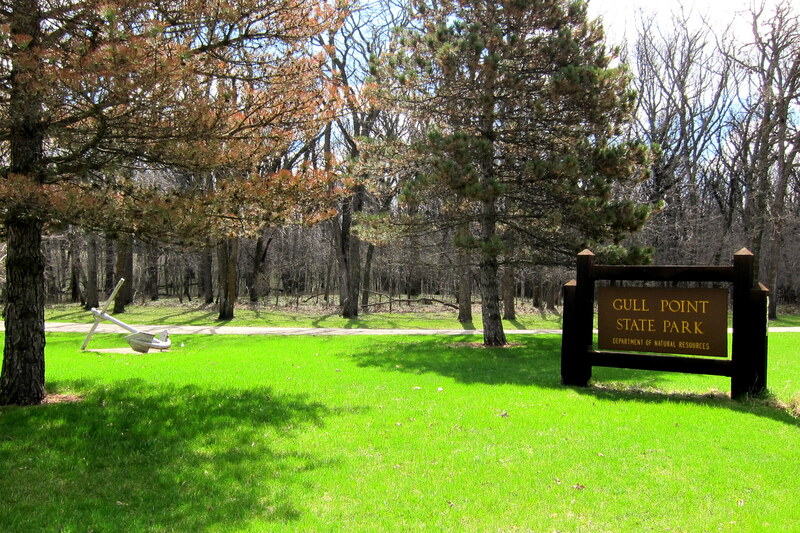 The park was on Saint James Lake and featured a number of waterside full hookup campsites. We were tempted to stay the night as the rates were very reasonable. However, it was too early in the afternoon and the wind off the lake was quite strong, severely buffeting the trailer, so we continued on. I write these journals using notes that Kit keeps in a notebook as we motor on. Unfortunately Kit likes to take afternoon “truck naps” so I have no clue what we did next or where we went…..the rest of Wednesday’s page was blank…..except for some dried drool. 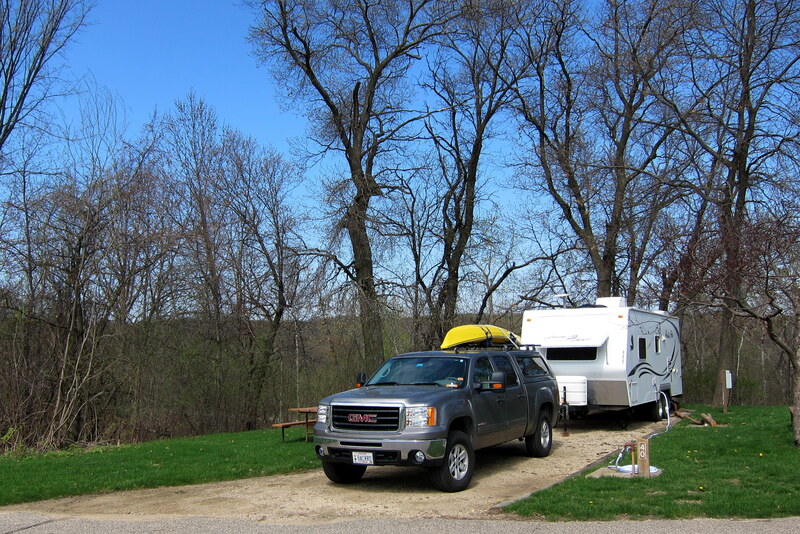 All I do know is that we camped for the night at Mineopa State Park just west of Mankato, Minnesota. At least that is where the next day’s truck log said we woke. Thursday, April 28, 2011: Woke early to cloudy skies and temperatures in the 40’s. I took a walk around Mineopa State Park campground and noticed we were one of only three other campers in the 61 site facility. 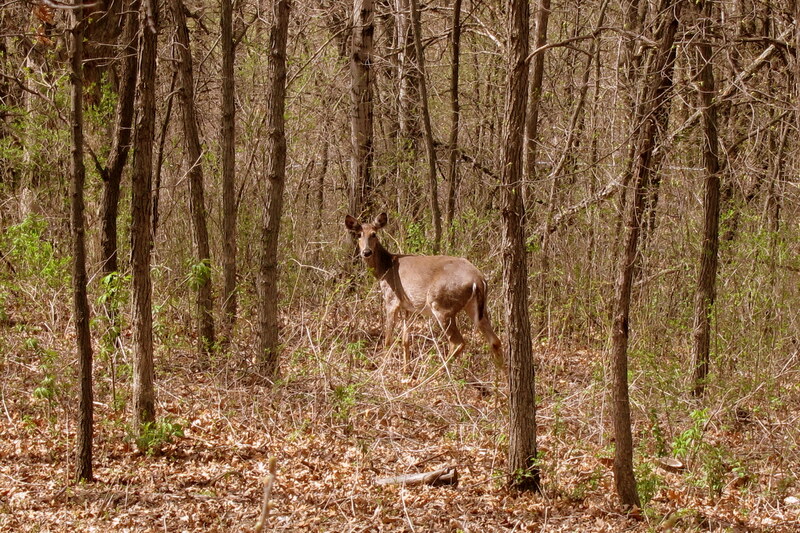 We did have a nice site however…..right near the banks of the Minnesota River. Since we were only 75 miles from out next destination we poked around Mineopa State Park a bit. Leaving the campsite with trailer in tow, we drove on a dirt road through the tall prairie grass and soon came to a grist mill built by a Mr. Louis Seppman in 1862. 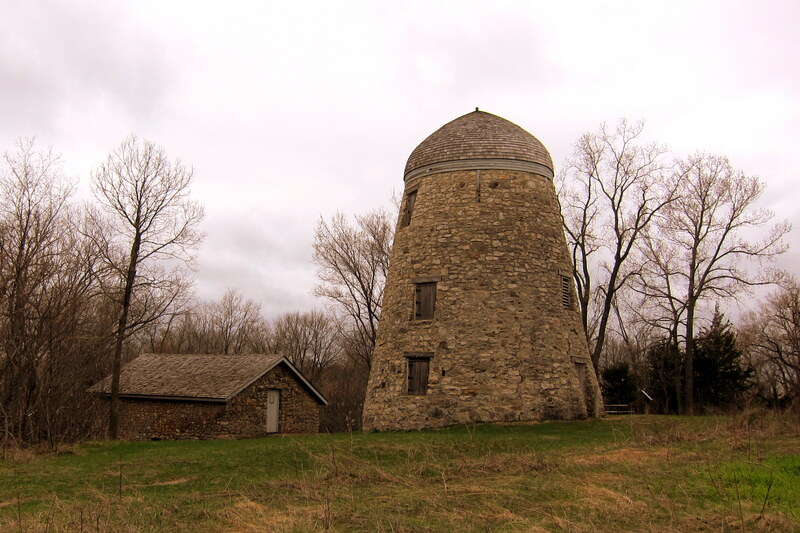 Mr. Seppman, a stone mason by trade, discovered the need for a grist mill to accommodate the farmers in the area. He built his mill without any plans modeling it after ones he had seen in his native Germany. All the wooden parts were cut by his hand, including the giant cogs. Not being a farmer he had no idea how to operate the thing so he hired a mill worker from a neighboring town. Finally ready for operation there was little wind for over 5 weeks. On the verge of giving up the wind arrived one Sunday morning. A devoutly religious man he hesitated to work on the Sabbath but took the sudden arrival of sustained winds as a holy sign and started to work. The mill was in operation eventually grinding up to 150 bushels of wheat a day into flour until a tornado destroyed the sails in 1880. The next stop on our tour of the area was Mineopa Falls. The word Mineopa means “water falling twice” in the Dakota Indian language and actually consists of two falls. The more dramatic lower falls pours over a shelf of harder rock that undercuts the underlying softer sandstone. 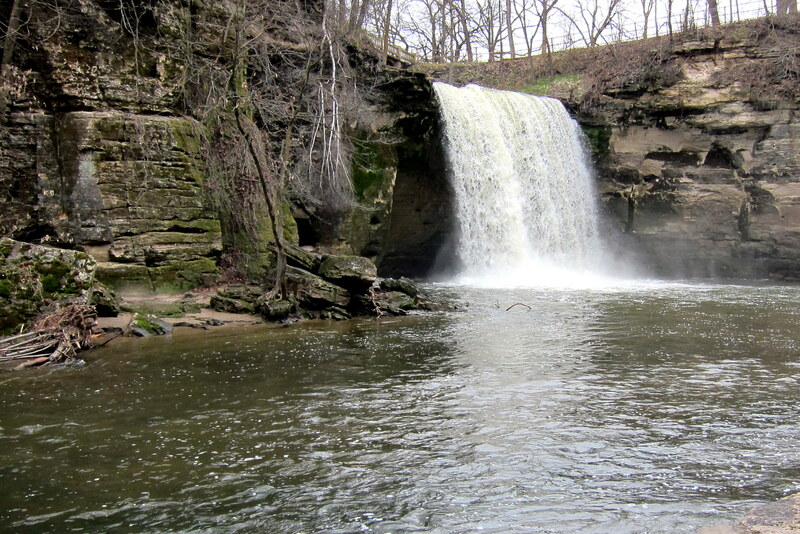 This unusual erosion process provides a pool behind the falls that must be fun to swim in on a hot summer day. At 1215 we departed Minoepa State Park and drove on highway MN-60 then moved over to US-169 heading north toward the Twin Cities. 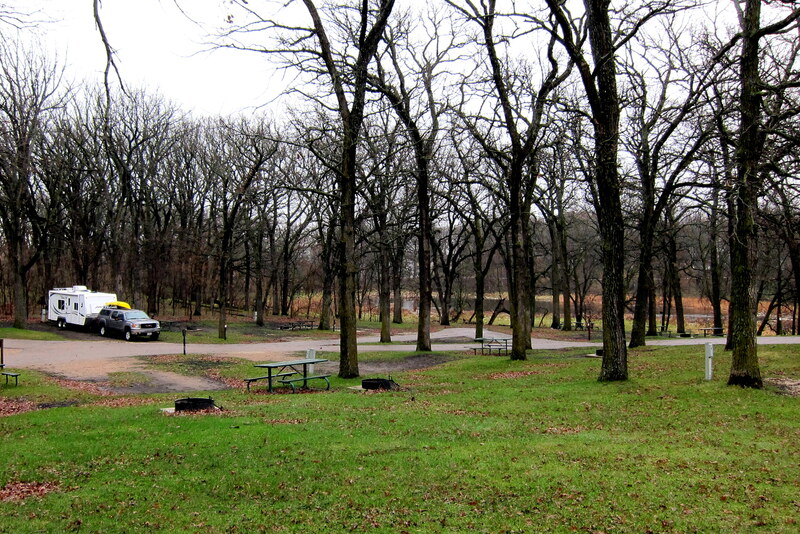 Our intention was to stay at the very nice Lebanon Hills County Park in Apple Valley, Minnesota for the week. However the campground does not open until Monday so we found our way to East Saint Paul RV Park for a few days stay instead. Once again, no neighbors…..we’re starting to get a complex. It truly is a bit early for camping…..even for the hardy folks who live in Minnesota. The weather for the next few days would be overcast and cool with temperatures rarely reaching 50 degrees. However, we didn’t come to this area at this time of the year to enjoy the weather; we came to visit relatives, including my father and his friend Henrietta (Hank). They live in a very nice home in Inver Grove Heights. My father has been battling some serious health issues of late so we decided to focus on him and Hank for the duration of our stay. We spent many hours visiting, helping out, reminiscing and eating some fabulous home cooked meals. In addition we made sure to patronize the many fine restaurants in the area. 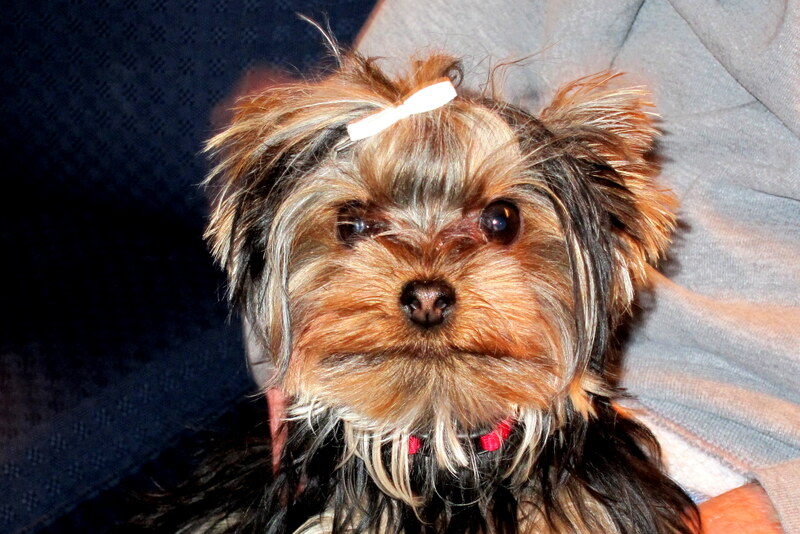 They have a menagerie of animals living with them; the biggest character is Gracie…..an 8 ounce spitfire. Dad and Hank’s place backs up on county parkland and they have no shortage of wild animals and birds that visit them. This guy was grazing right out their sunroom window. Friday, April 29, 2011 through Sunday, May 8, 2011, The Twin Cities area of Minnesota: On Monday we pulled up stakes and headed for the hills, Lebanon Hills State Park, that is. 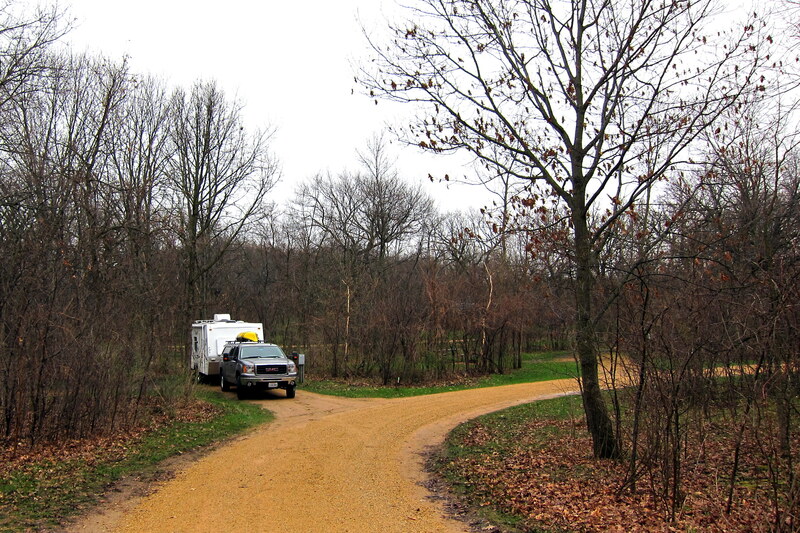 Since it was opening day we had our choice of campsites and chose this nice spot on the edge of the forest. The weather was getting better, sunny and temperatures approaching 70 degrees…..It’s shorts time once again, folks! And the wet weather coupled with the warm sun has caused the grass and trees to bust out in green. One day we drove into the city to visit Kit’s Aunt Viola. Aunt Vi who is 92 lives independently in a nice senior apartment. She was very excited to see Kit and talk of earlier times. She is a delightful woman with an interesting past and it was a pleasure visiting with her. Aunt Vi’s son, David lives nearby and was able to join us that evening at a nice Italian restaurant called Buca di Beppo. This restaurant is a chain of 87 stores spread around the US. 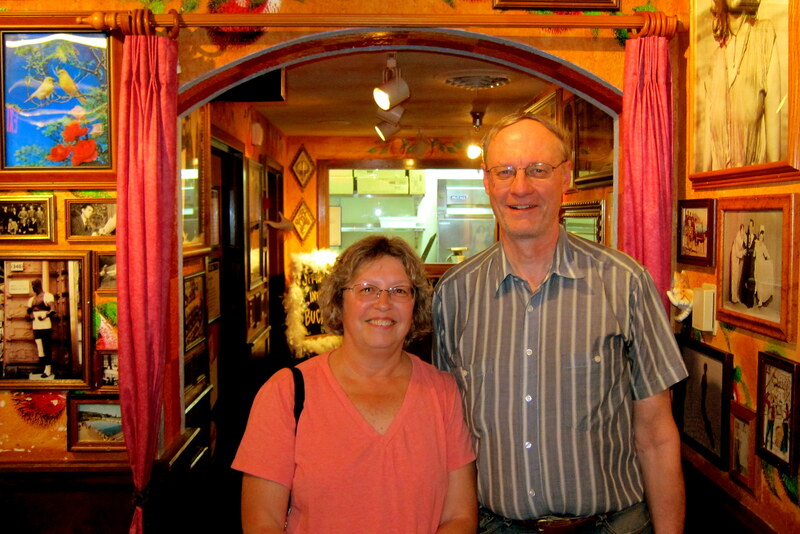 The food and atmosphere was incredible……check it out at http://www.bucadibeppo.com/. We highly recommend visiting one in your area. Dave is an accountant but his hobby is working with wood. He has constructed some beautiful pieces of furniture over the years using antique tools, methods and materials. 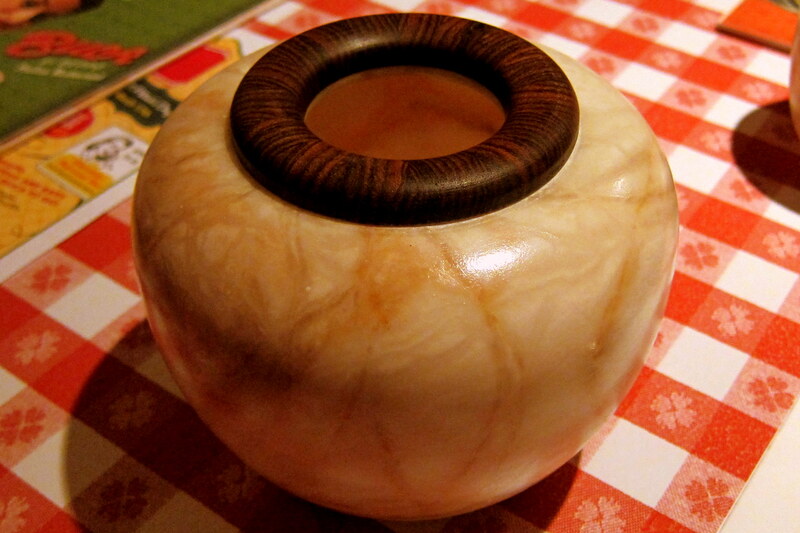 He has recently turned (no pun intended) his wood lathe skill toward working with the stone, Alabaster. Below is a sample of his recent work that he brought along. Enjoying our food and drink and the great company we pert near closed the place down and didn’t return to the camper until midnight. 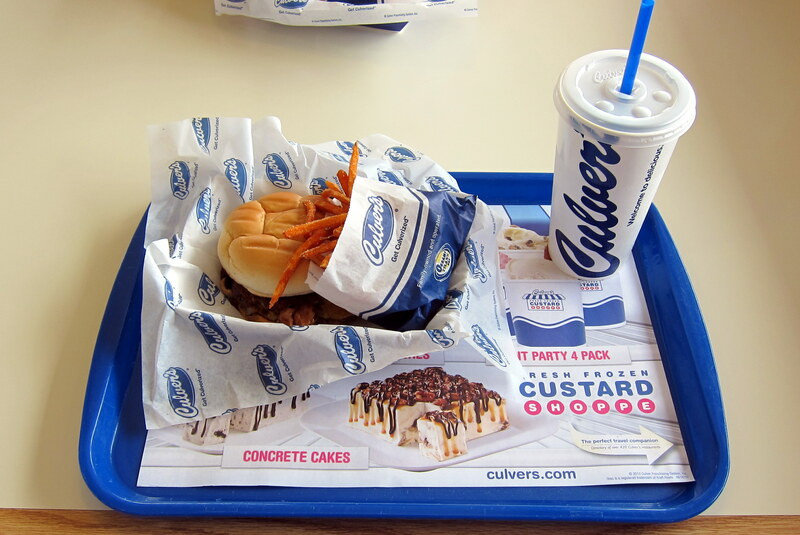 So why did we visit Culver’s twice? And just what is a Culver’s anyway. Well think back to the best hamburger you have ever tasted, and multiply that taste by 200%! It’s that good…..honest! Up till now we thought In and Out Burger had the best meal but in our opinion Culver’s beats them hands down! After eating so much each day, we usually found a shopping center to walk it off. Kit had a blast visiting the thousands (?) of shops and I enjoyed walking around watching other folks. I did find a nice bike shop to spend some time at however. Erik’s Bikes is a Twin Cities institution and the largest bike shop I have ever seen. Even larger than Mellow Johnny’s, Lance Armstrong’s bike shop, in Austin. Since it was midday on a week day I was able to monopolize the sales persons time and talk bikes. I even got to take a high end road bike for a 45 minute spin. Kit witnessed me ride by the yarn shop she was in and pert near had a heart attack. It’s an amazing experience to ride a bike that cost’s more than my first new car! Speaking of bikes (notice the multiple Segway’s?). Lebanon Hills County Park has an incredible Mountain Bike Park which was closed due to muddy trails until a few days before we left. 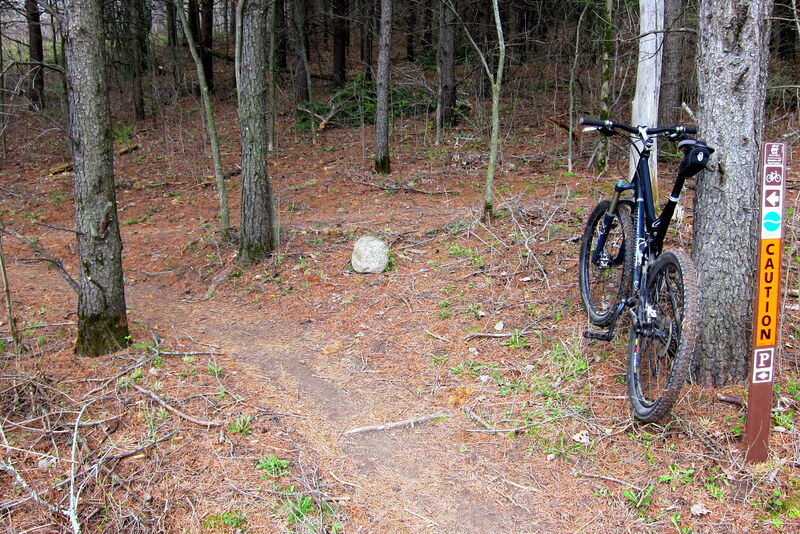 I rode this extensive trail system two years ago and enjoyed riding them again this time. They are very well designed and maintained. 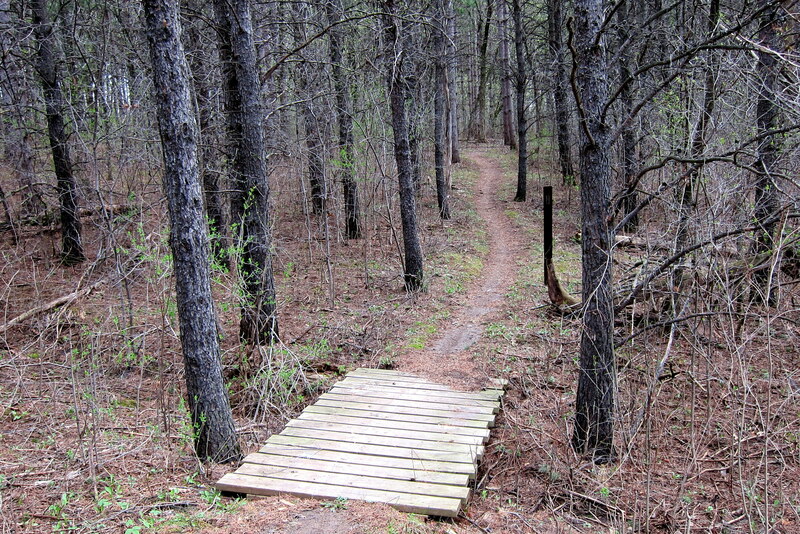 Even though there is little elevation in this part of Minnesota the trail builders made the most of it with berms and bridges. I could ride this 10 mile Mountain Bike Park often and never get tired of it. Returning from a ride, (another Segway! 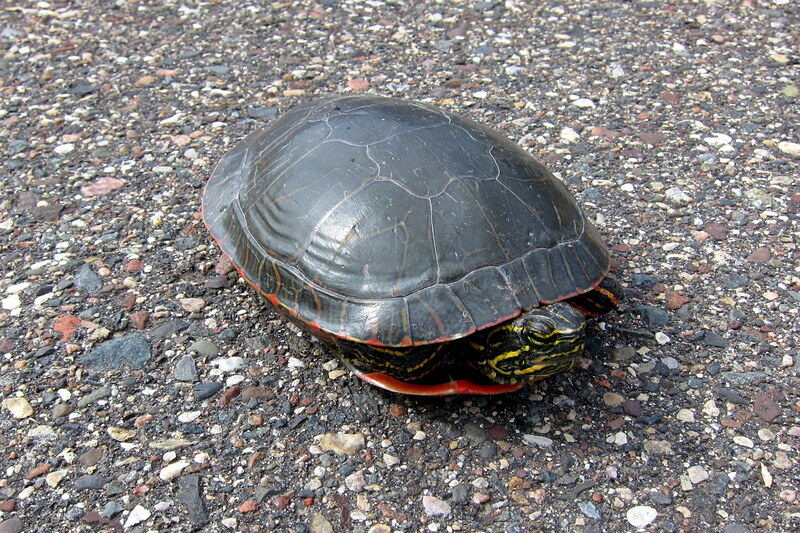 ), I came upon this fellow slowly crossing the road. In order to gain more Karma Points I turned around and relocated the little road hazard to the other side which led to a pond. Not sure he really appreciated my sacrifice but riding by a while later I noticed he was happily wading around in the water. 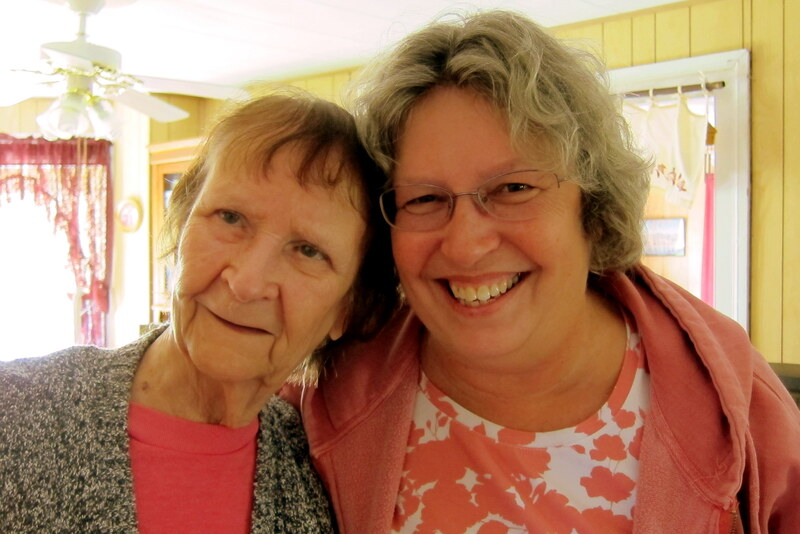 On another day, we drove down to Pepin, Wisconsin to visit Kits Mother’s Cousin Wilma. Wilma at age 91 still lives, independently, in the home she was born in. 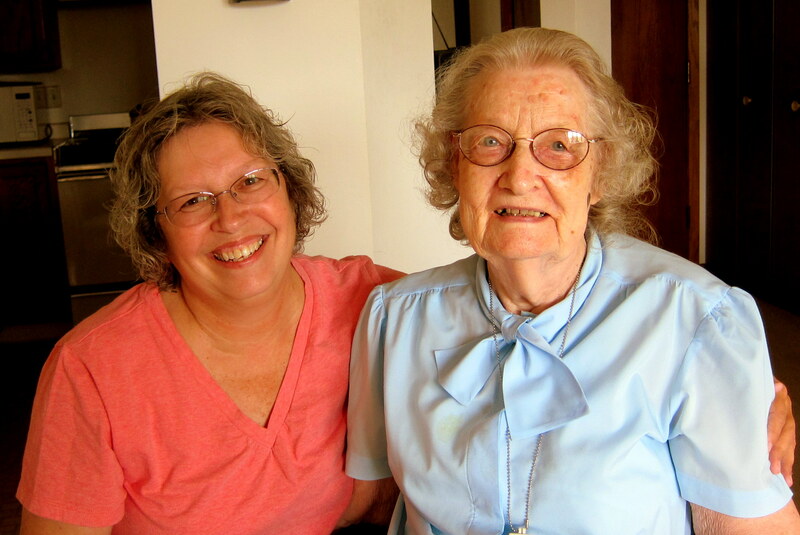 She has never been on a plane and has never traveled more than 65 miles from her home…..in the past 91 years! She is a hoot; sharp as a tack, and has some incredible family stories…..some of which I was able to capture on video and are of “You Tube” caliber. While in Wisconsin, we also visited Hudson, the hometown of Kit’s maternal grandparents and other family members. We rode past everyone’s home and Kit reports that the places still look as they did 55 years ago. 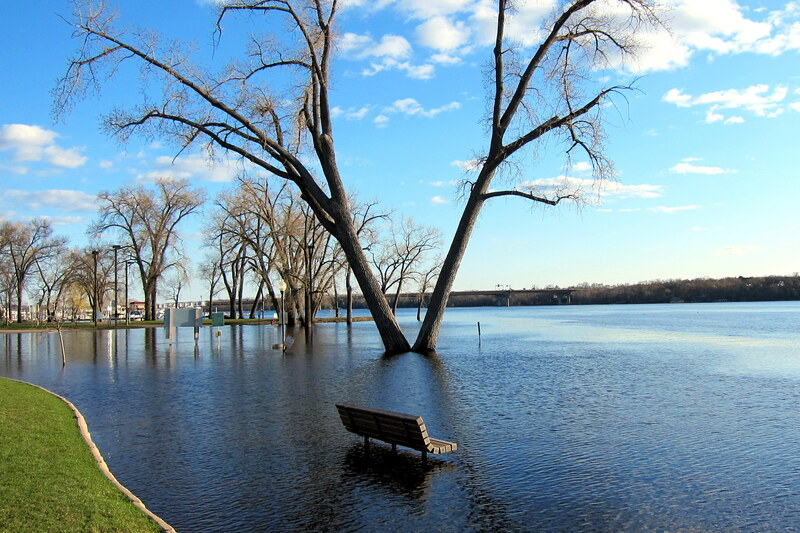 Hudson sits on the banks of the Saint Croix River which feeds the Mississippi. This spring all the rivers in this area are above flood stage. 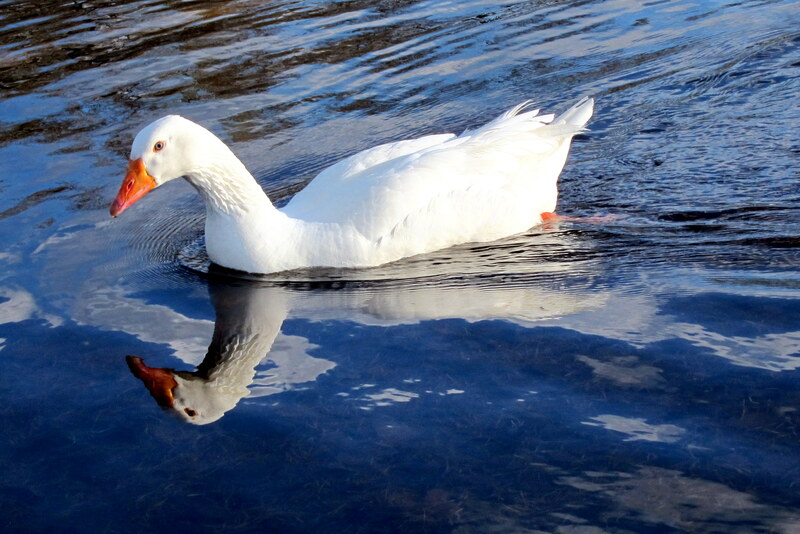 Standing on a curb, I was able to capture the following photo of a White Goose paddling around a submerged parking lot. We really enjoyed our stay in the Twin Cities but tomorrow we continue our trek north. 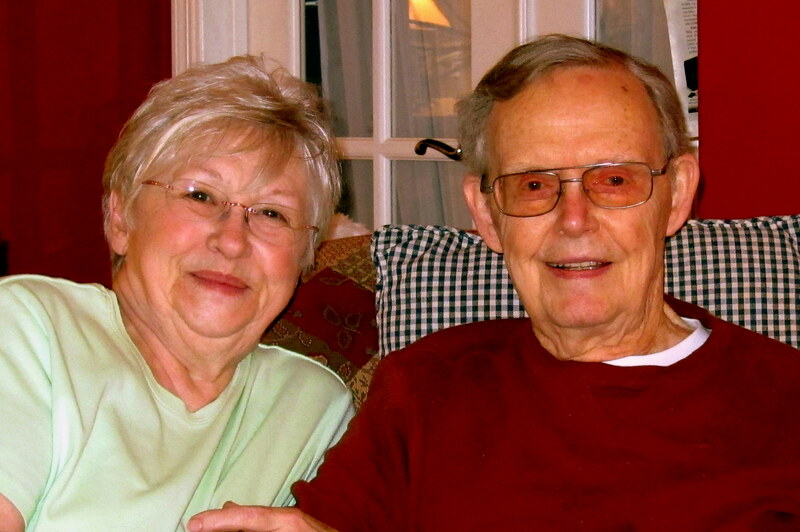 Thanks Hank for taking such good care of Dad and for being so gracious to us…..we love you both very much. 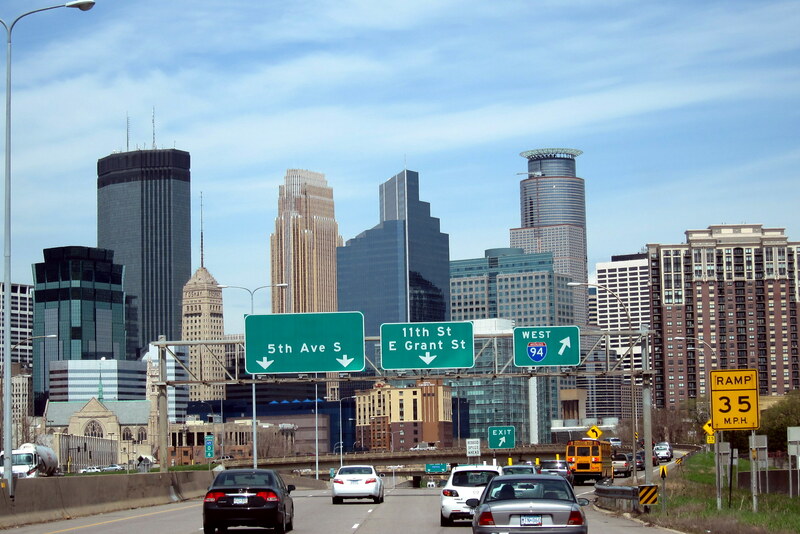 Kit’s Twelve Cents Worth: We had a wonderful time in Minnesota, my home state. It’s quite similar to Maine, and I always enjoy seeing my relatives as well as places I remember as a child. 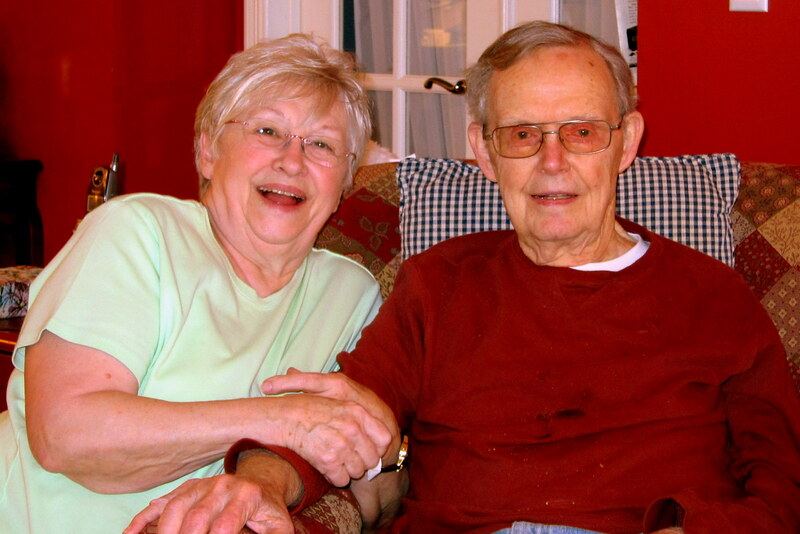 It was good to spend time with Bill’s dad and Henrietta. We also met her daughter Faye this time through, which was great. We feel very much at home visiting with all of them. Buca di Beppa has a restaurant in downtown Honolulu. We have been there with Terry & Lee twice throughout the years. Atmosphere and food absolutely wonderful! 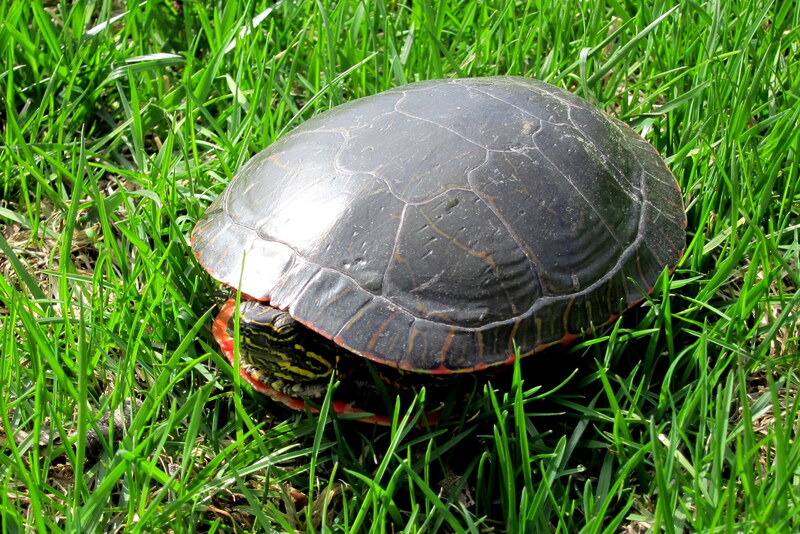 Umm…how could you tell the turtle was “happy”? 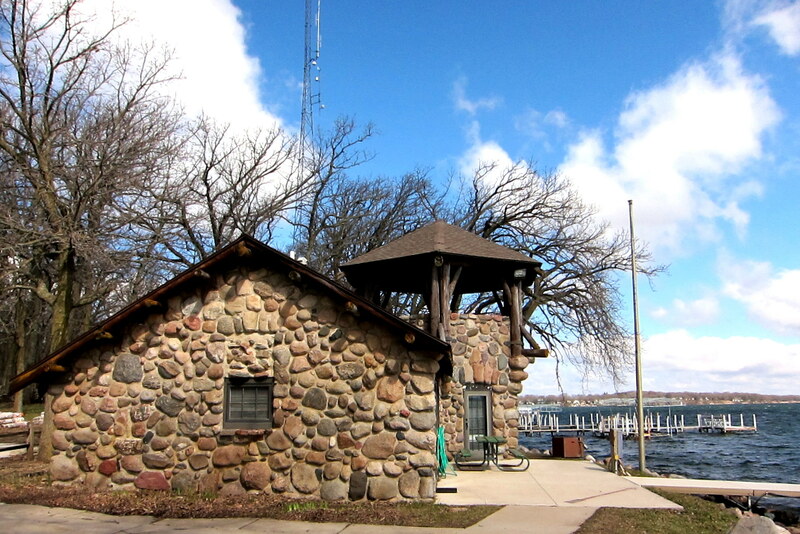 When you were in Pepin, WI did you happen to visit the Harbor View? This is one of our favorite places to celebrate signifiicant events like Birthdays and Anniversaries! It is right along the lake. The only thing between it and tlake are the road, the rail road tracks (with frequent trains) and the small marina. Both Chuck and I have spent a lot of time in Mineopa park. Chuck spent time there while growing up in southern MN. I spent time there when I was in college in Mankato. It is great that you are able to see and experience some of the places that are near and dear to our hearts. We drove around Pepin a bit and explored the waterfront. Since we had already eaten we didn’t sample the Harbor View Restaurant; It is on the list for the next trip however. We intend to explore more of southern Minnesota next trip as well…..Kit was born in Rochester and has an interest in that area and I hear there is good kayaking on the local rivers. How long ahead do you make reservations to those crowded camp-sites?